It’s a statement I love so much I might have to pretend I came up with it myself. It’s not a new concept, sure. In fact, if you think about it, this is merely a twist on ‘wisdom from the mouths of babes’, itself a twist on a line that a quick Google search tells me originates from the Bible, to be precise Psalms 8:2. But it’s a perfect statement for these difficult times, when stress levels seem higher than ever and most of us are working for far too many hours just to stay afloat. Quite frankly, we’ve forgotten about the value of play. Whenever I work from home I try to make sure I head out for a run or a wander at least once a day, because that’s when I do my best work. By which I mean, I’ll be running along my favourite woodland track and once all the usual preoccupations (‘Will I meet that deadline?’ Why hasn’t that PR lady sent me the pics she promised? What shall I have for lunch?’) filter away, fresh ideas, plot-lines, the perfect closing sentence to that feature I’ve been stuck on, all rush into my head. Which is why my pages of notes often have smudged areas thanks to me scribbling it all down while dripping with sweat. Lovely. But the point is, taking a break and have a bit of playtime isn’t just enjoyable, it’s a great work ethic. It frees up your imagination and sets your sense of wonder free! The second aspect of this philosophy is more challenging, because it demands that you forget every painful lesson you’ve learnt and retrain yourself to be a bit naïve – to never hear the word no when what you’re seeking is a yes. Quite simply, to act as if you’re life has been entirely about yeses, and you deserve that good fortune. My three-year-old nephew is a strong believer in doing what he wants to, right now, because that’s how life should be. My sister, hubla and I took him to a local farm park recently, and after he’d had a few hours of playing on toy tractors, petted a baby rabbit, a chicken and a baby guinea pig, then watched a puppet show, we went to see the falconry display. 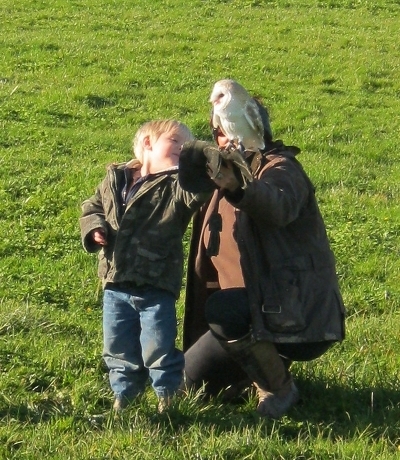 Then they asked for volunteers to help with George the barn owl. My nephew wasn’t chosen, but before we could stop him he’s run down from the seating area to the lady who was helping the child who had been selected. And rather than send him away, she let him stay, helped him hold his gloved hand up high enough for the barn owl to land on. And it was magical. I’m not saying he was right to ignore us calling after him. It could have been really dangerous, but on this occasion he was lucky, and he got exactly what he wanted because he was bold. This entry was posted in Inspiration and tagged imagination, wonder by Judy. Bookmark the permalink. Love the sentiment in this piece – got to agree, being able to think like a child definitely helps when it comes to pursuing dreams!